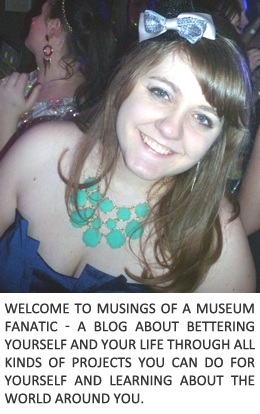 Musings of a Museum Fanatic: Motivation? Have you ever had one of those days where you just can't bring yourself to do anything more than just watch terrible reality TV and play mindless games online? I fee like I've been in a month of that. Don't get me wrong I haven't just been sitting in front of my computer for a month not showering or going out into the world. It seems when it comes to actually sitting down and being productive with something I just can't bring myself to accomplish it. It took me a month and a half to finish up the crescent canvas but yet it still sits on my desk unwrapped and unsent! There are emails that really need to be sent about Pampered Chef and bloggy things but for some reason forming coherent thoughts to write them just seems to impossible. Don't even get me started on the insurmountable task that is a cover letter this month. Do I just have a terrible never ending case of the Mondays? Or can I blame it on the back and forth weather in Chicago? Maybe just the fact that it's winter in general and when I looked outside I just want to curl up in bed. Maybe this week I can power through and actually accomplish something. If someone has found my motivation please grab it and send it back to me, it will probably be singing "Livin' On A Prayer" and dancing in circles. 1. Write one wedding post. I actually wrote it this morning since I didn't want to have only one thing on my list completed this week! I blame winter for the blah- unmotivated feeling. I feel the same with regards to my grad school to-do list. Good luck with this week's 5!! I COMPLETELY understand what you're saying. I feel like I was in an unmotivated, stuck, come home from work watch TV, BLAH mode for pretty much ALL of January & I'm fighting it off for February, too. I think it's the season?! That's what I'm blaming it on! You've got some great goals this week! Good luck with the job applications! That's tough, but, I KNOW you can do it! Weekend Update & 5 for 5!!! Would You Call Me Stylish? Weekend Update & 5 for 5!